He's also a favorite of mine so today I'd like to simply share 5 of my favorite happiness tips from that honey loving bear. And so you get lost in your circumstances. This way of thinking doesn't feel too good. You tend to feel powerless and like you are just drifting along in life. Another way of going about things to be proactive. To be the one who takes action first and to take the lead. It's not always easy though. You have to get out of your comfort zone and it can feel scary. Although the answer probably varies but I'd rather spend most of my time with doing the latter. Use words that helps you to get through. No need to try to impress people with big and complicated words when it's not needed. Focus on getting through to others and communicating by using simple words that anyone can understand. This website and the opportunity to write about what I want. Myself and the fine things about me. You might then move your attention outside, through the window and see the wonderful sunshine, then kids having fun with a football and then the tree by the road turning into wonderful autumn colors. And so on. 4. Do nothing in a while – This is so awesome advice. And it’s so difficult to ‘do nothing’ . May be this in fact requires training our minds to go for a sleep while our body is awake. “Nobody can be uncheered with a balloon.” I love that. And there are balloons everywhere – you just have to look! A wise bear that Pooh. Beautiful post Henrik. 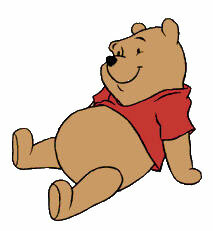 I had a great-aunt who read the Winnie the Pooh books to me when I was seven – you’ve brought back some lovely memories. What I hadn’t remembered is that there was so much wisdom in there too. Thank you. I feel if we could apply tip #1 and 5, happiness would become a secondary nature. There is so much to be thankful for if we could just stop sweating on the small stuff and take stock of all the good things that we have. Then, to make things even better, we can work from a place of confidence to fix all that is not going our way and double our happiness! Happiness comes from within and can be intentionally created through the application of simple habits done consistently.